Amy Kaplan was less than halfway through a photography degree program at the Art Institute of California-Hollywood last summer, but she was at a crossroads. A single mother relying on food stamps and the generosity of her parents in Orange County, Kaplan had major doubts about the for-profit institution that had promised real-world internships and access to cutting-edge technology. The career services staff wasn't connecting her with the professional contacts she needed in the field, and the quality of professors was spotty at best, she recalled. Some instructors just showed movies in class, or sent students to museums to look at photo exhibits, she said. She also wanted to leave the door open for pursuing teaching or advanced degrees at other institutions, but learned that the Art Institute credits wouldn't transfer to California state schools. Kaplan faced a stark choice: continue to take out loans for a degree program she doubted, or drop out and swallow more than $25,000 in student debt. She chose to leave, joining a fast-growing segment of American college students who have nothing to show for their extensive debt. "It felt like I wasn't getting anywhere," said Kaplan, 30, who is raising a 6-year-old son under her parents' roof in San Juan Capistrano, Calif. "I just kept seeing my loans piling up and piling up, and I realized my degree was basically going to be useless." A larger share of college students are borrowing to pay for their education, and more of those borrowers are dropping out, according to a recent study by Education Sector, a non-profit policy group that analyzed changes in student debt trends over the last decade. The trend is far more pronounced at for-profit colleges, a sector of higher education that has expanded rapidly over the last decade by marketing to low-income students who qualify for federal loans and grants. The study tracked two groups of college students for six years: one that enrolled in the mid-1990s, and another that entered school in the mid-2000s. 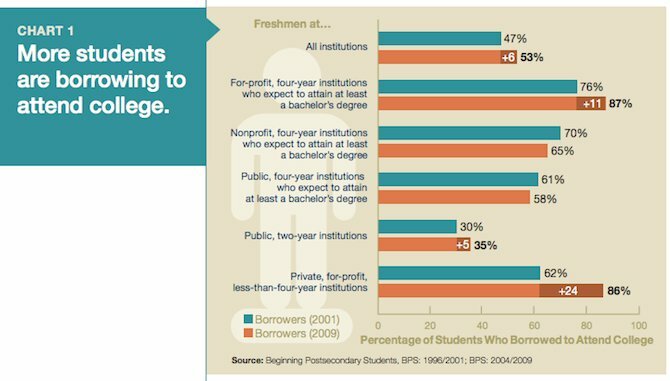 Over that time period, for-profit institutions saw the highest jumps in both the percentage of students who borrowed to pay for education, and the number of those borrowers who eventually dropped out of school. Students who borrow to pay for a four-year for-profit college are more than twice as likely to drop out than student borrowers at four-year public institutions, according to the report. The dropout statistics at for-profit colleges were up significantly from a decade before, reflecting the industry's rapid-fire growth. From 2000 to 2009, the number of students enrolled at for-profit colleges more than tripled, increasing from fewer than 500,000 students to more than 1.8 million. About 10 percent of college students nationwide are enrolled at for-profit colleges, yet the sector takes in more than a quarter of federal student aid dollars and is responsible for nearly half of student loan defaults. The report notes that for-profit colleges "contributed a substantial portion of the increase in overall student borrowing from 2001 to 2009, even though they enroll only 9 percent of all college students." The for-profit college sector encompasses a wide range of institutions, from trade schools such as ITT Technical Institute to larger, mostly online colleges such as Capella University. Representatives for the Association of Private Sector Colleges and Universities, a trade group that represents the industry, did not respond to questions about the study. A spokeswoman for Education Management Corp., which owns the Art Institute schools, also did not respond. Dropping out can have serious consequences for future employment, and student borrowers at for-profit colleges end up the hardest hit, according to the report. Borrowers who dropped out of school faced a 26 percent unemployment rate overall, but borrowers who dropped out after attending for-profit colleges of less than four years faced unemployment rates of 36 percent. Comparing the mid-1990s group and the mid-2000s group in the study, for-profit colleges saw larger increases in unemployment than any other sector of higher education. "This is likely a function, in part, of for-profit colleges recruiting a large number of lower-income students who qualify for federal financial aid," the report stated. Since dropping out of the Art Institute in Hollywood last summer, Kaplan said she has applied for hundreds of jobs. She hasn't found any that offer enough pay or hours to make it worth hiring a sitter for her son, Kevin. To stave off her student loan payments, Kaplan enrolled at a nearby community college, where she pays nothing out of pocket. None of her credits transferred from the Art Institute, because the school's accreditation isn't recognized by the California community college system. "Looking back on it, I feel so stupid," Kaplan said. "I feel like I'm so far away from a degree. Sometimes it feels like, why try any more? By the time I get a degree, I'm going to be 40." For now, she's dedicated to building up enough credits to transfer to a four-year university, and eventually get back to her dream of working as a magazine photographer. But the $25,000 student loan debt is never far from her thoughts. Sometimes she wrestles with her decision to drop out. For years, she'll be paying off loans for a program that didn't get her anywhere, plus a new batch of loans expected after community college. But in Kaplan's estimation, cutting losses simply made the most sense. "It was definitely not worth it to continue," she said. "I just would have built up more debt, got the degree and then realized it didn't really matter anyway."